The HDS-40X is BendPak's heaviest-duty, extended-length truck lift. That makes it the most powerful offering in our arsenal. A rugged design with safety features unmatched in the industry, anyone working on massive commercial vehicles should consider this mighty machine. 40,000 lbs. take a lot of muscle to lift, and many vehicles of this caliber are longer than our standard-length series of four-post lifts can accommodate. If you want to be prepared for the longest and heaviest vehicles on the road, you need BendPak's most impressive offering—and this is undoubtedly it. With runways that measure in at a whopping 310”, the HDS-40X is the heaviest-duty extended-length car lift we make. Slap a bus on it and get to work, no sweat. The power of this lift is no light matter. Military contractors, government entities on all levels and large commercial truck repair companies have all sought this lift out, knowing there's nothing they can throw at it that it can't handle. Far from being a hobby lift, this industrial-grade powerhouse is only going to fit in serious-minded commercial maintenance spaces. You'll need a big bay with high ceilings, and if you have that, the HDS-40X doubles as a parking lift and ultra-safe storage space. Super-duty vehicles need a clean approach and a wide runway to safely board a lift. At 28" wide, these runways accommodate tires of virtually any diameter and width. The non-skid surface is sure to grip tires and hold them in place, even if they get wet or oily during your work. BendPak cable sheaves are made to dominate every lifting application, however big or small. 12" diameter sheave bodies and 4" axles make them far more likely to last the lifespan of your lift because of their sheer size and quality of construction. Truck lift base plates are made super-wide, which makes sense considering the size of the vehicles you're putting on the runways. 12 x 12 plate dimensions are extremely secure for maximum stability and lifting longevity. 13 lock positions offer up to 60" of rise for comfortable undercarriage access. All locks automatically engage during rise and disengage at the touch of a button. Just one look at the lock sizes will inspire confidence that this lift is safer than any you've ever seen. The primary locks are more than enough security, but we don't leave a single, tiny thing to chance. So, we include a backup cable-slack detection system that captures loose cables immediately if slack develops. This system makes it entirely safe to remedy any issues without risking uneven platforms. Need to perform wheel service on your fleet? Of course you do. Pick up a pair of RBJ25000 bridge jacks and start working. 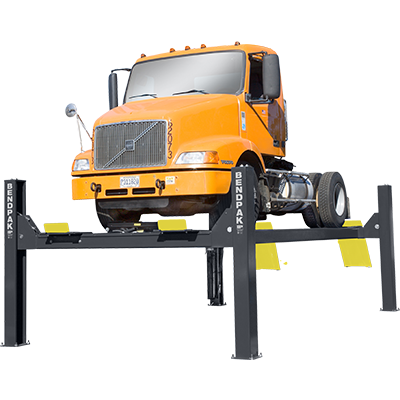 Together, two jacks will lift a vehicle up to 50,000 lbs., but keep in mind the HDS-40X has a 40,000-lb. limit. The extra 10K is not just peace-of-mind, but a practical consideration since the front half of most trucks (where the engine and transmission rest) is likely to be heavier than the back.